A Rolex watch inside what appears to be a sterling silver Movado case, although it is not marked. The Rolex movement is from the 1940s, and the watch looks as though either someone asked Rolex to create this watch as a one-off, or a jeweler created it many years ago. Regardless, it is in excellent shape. 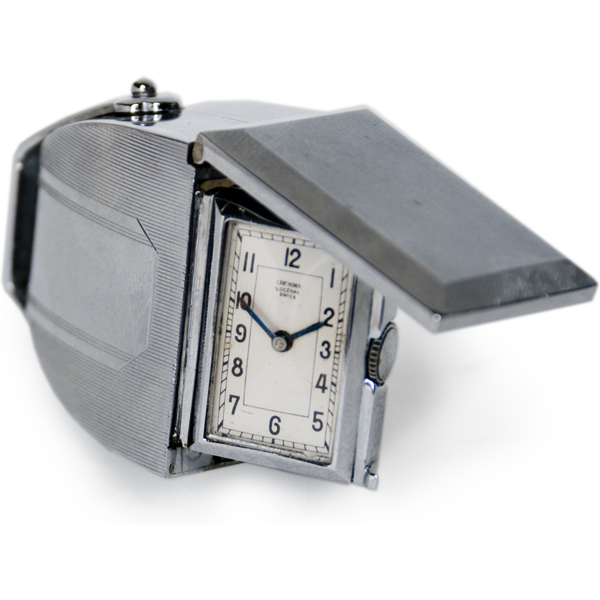 Elgin, Gruen, and Benrus were among the only American watch manufacturers to create travel watches. This steel with green decoration one is very old, dating back to World War I or before. It has an Elgin movement. Lusina was a Swiss brand that, like many, others disappeared in the Quartz Revolution. 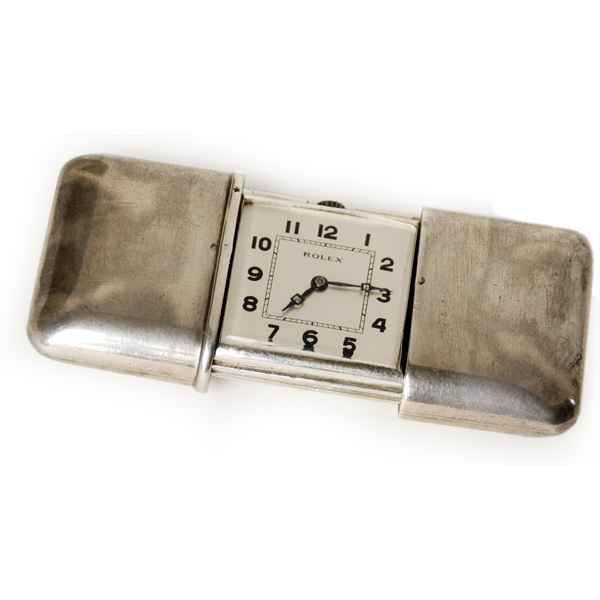 It made high-grade movements for other companies before its demise, and several travel watches, including this interesting, odd-opening sterling silver watch from the 1930s, with a Lusina movement. 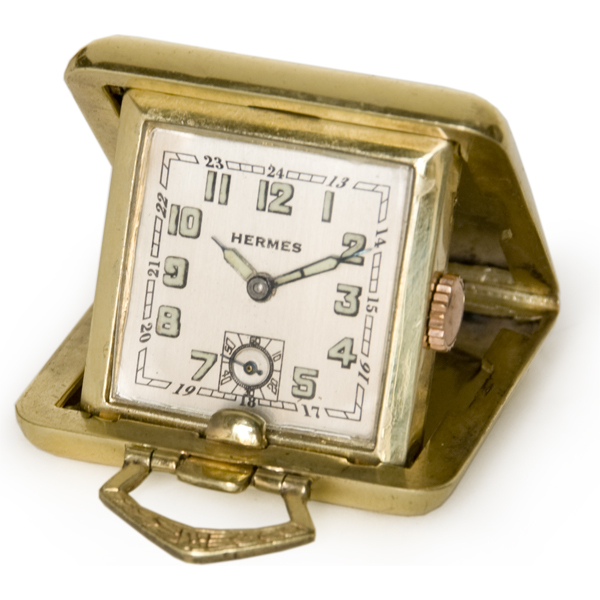 A gold-filled Hermes travel watch from the 1950s. 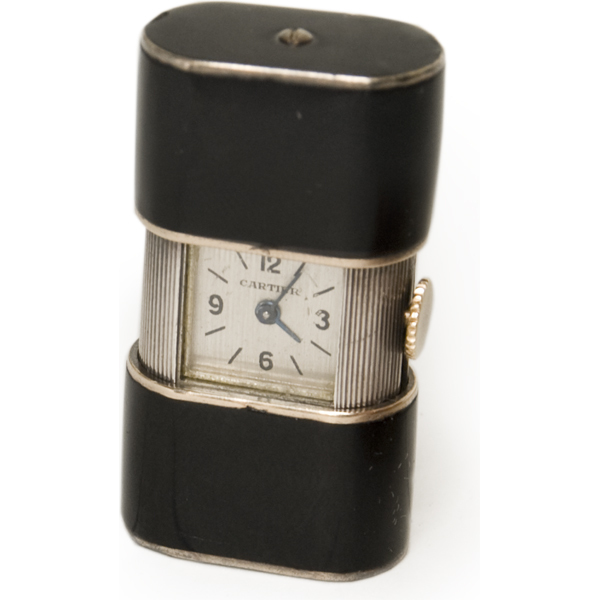 A beautiful deco black enamel and gold plate Juvenia travel watch from the 1930s, with a Juvenia movement. This Clarte digital watch was a model often retailed by Hermes, although in this case it is not marked. It keeps remarkably good time. 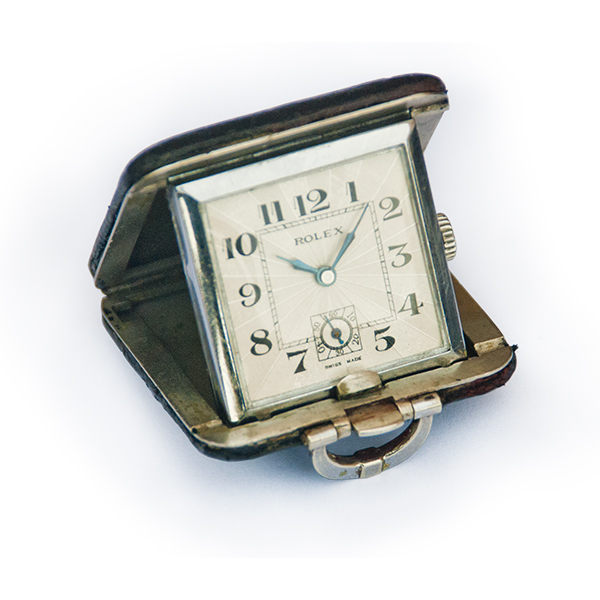 An extremely old Rolex travel watch with an excellent (and remarkably clean) Rolex movement, the Rolex office in New York guessed this might have been made some time in the 1910s. They had never seen one like it--nor have I. 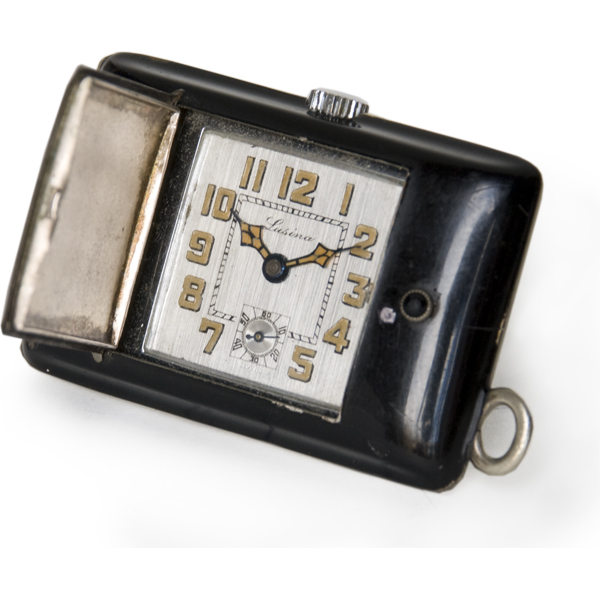 The case is unusual, made of what looks like chips of white and black tile, or enamel. 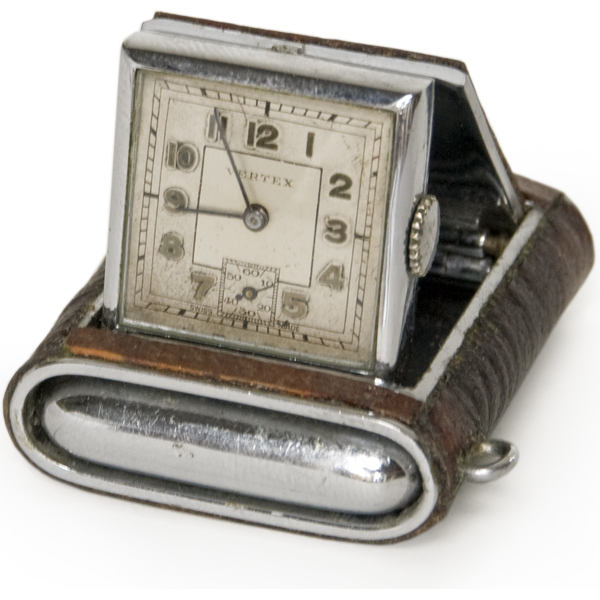 Like the Unicorn Rolex, the Marconi name was used in the 20s by Rolex for less expensive models. This Marconi has an alligator case. Perhaps the most celebrated of all travel watches made in quantity is the Rolex Sporting Prince. 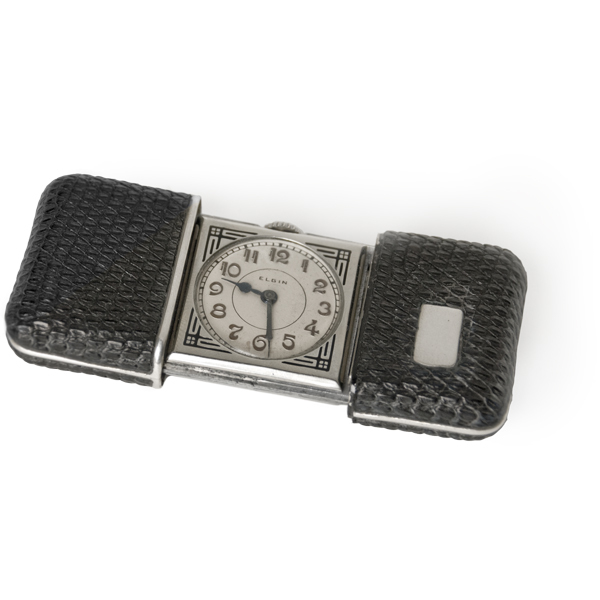 Using the same movement as a regular Prince wrist model, these watches were extremely popular in the 1930s and 1940s. Rolex also made a few Rolex Sporting Princes to fit over the wrist, like a regular wrist watch, but with the same casing and catch as the travel watch. The most famous travel watch is probably the Movado Ermeto. 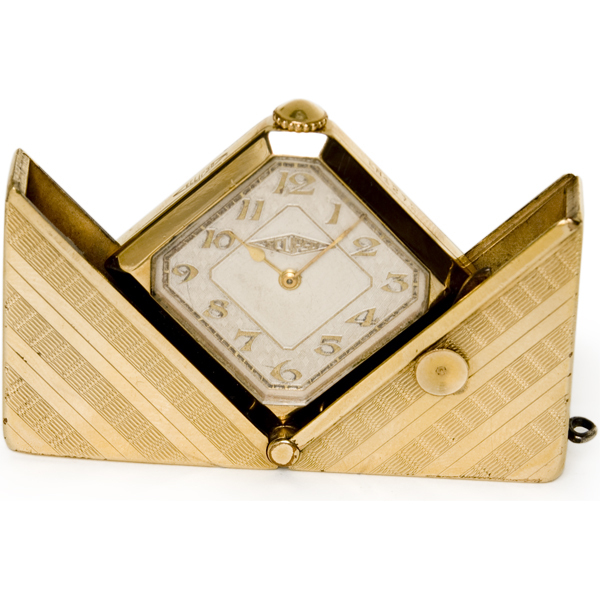 And, this watch was indeed marketed as a purse watch, although it was sold to both women and men (presumably to men under a different rubrick). 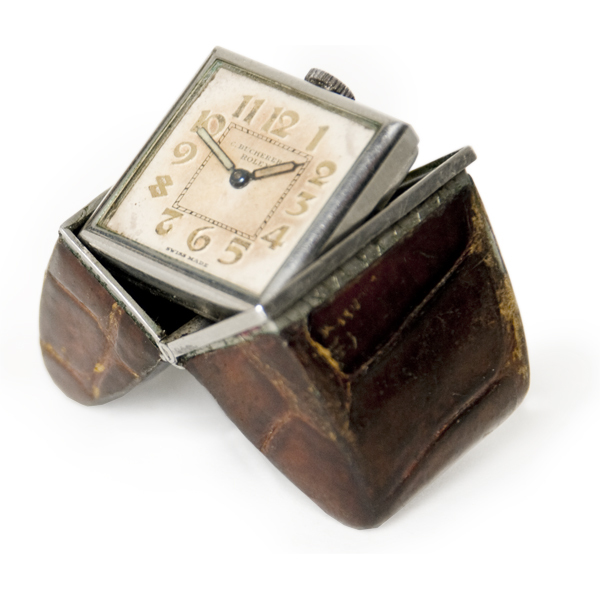 The Ermeto was first made by Movado in the 1920s; encased in a leather or silver box, opening the case not only revealed the case, but also wound the watch as well. 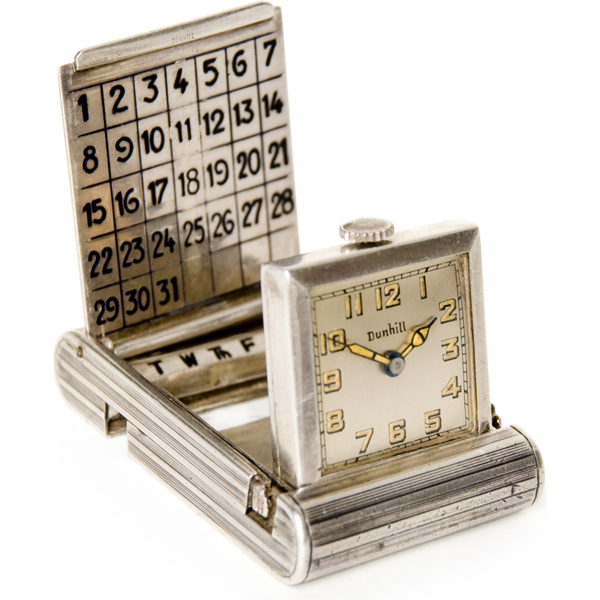 The watch was produced in many styles and with many complications, including a triple date calendar watch. This particular model is the standard Ermeto. 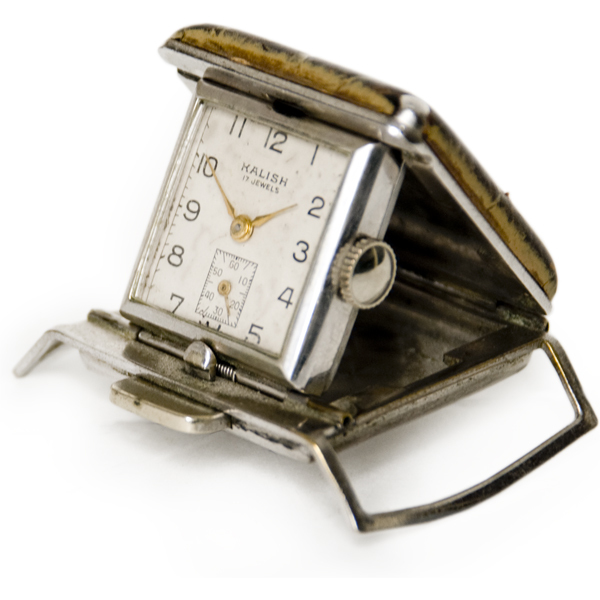 In July 1929 Mrs. Ethel Wade traveled to Europe (perhaps for the only time in her life) and bought, at E. Gubelin in Geneve, six travel watches (called "satchel-watches" on the receipt). Five of them cost about 180 francs each, but the sixth cost 1877.20 francs. 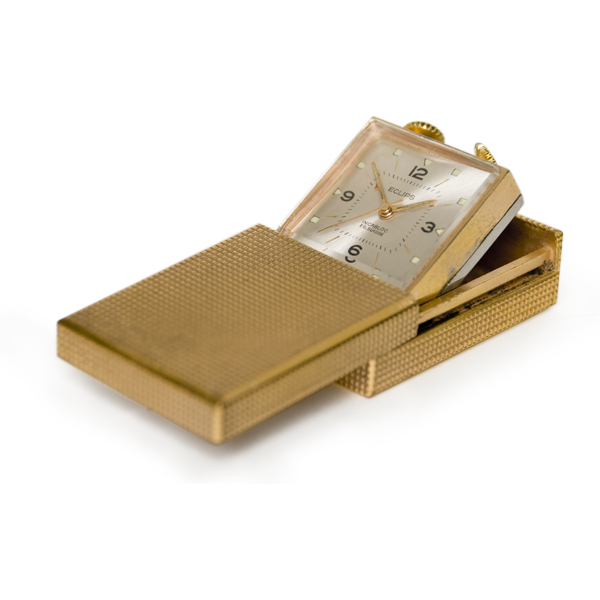 This sixth watch was an 18 carat gold travel watch containing a high grade movement from Vacheron Constantin and was cased by Verger Freres, a high-end jewelry and watch-making firm that created beautiful art deco pieces in gold, silver, and platinum for brands such as Cartier, Van Cleef and Arpels, Hermes, et al. 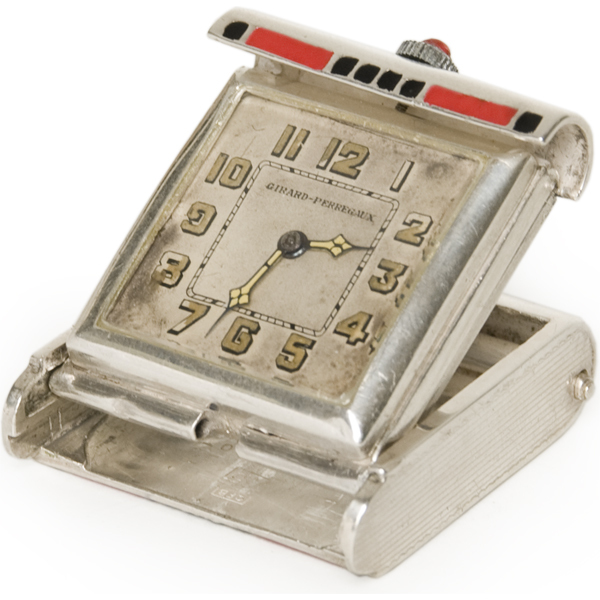 A few months later the stock market crashed and given the watch’s new-old-stock appearance, it looks as though it was never touched again. 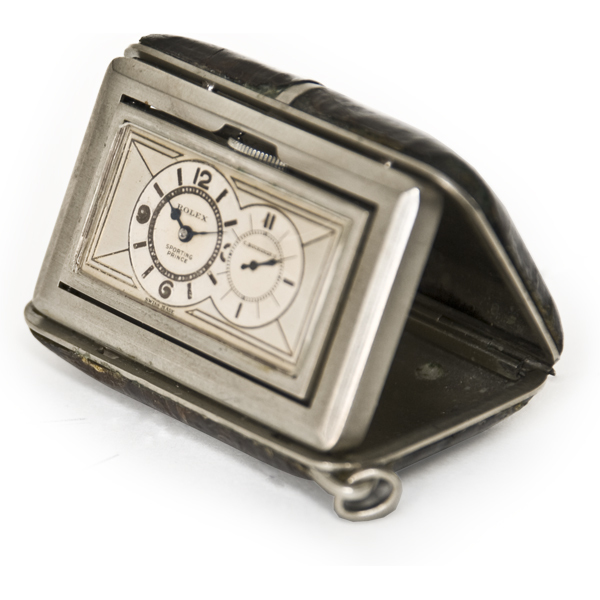 This watch was bought at auction along with Mrs. Wade’s passport (showing that she made only that one trip), the original receipt from Gubelin, and the watch’s original grey leather carrying pouch. 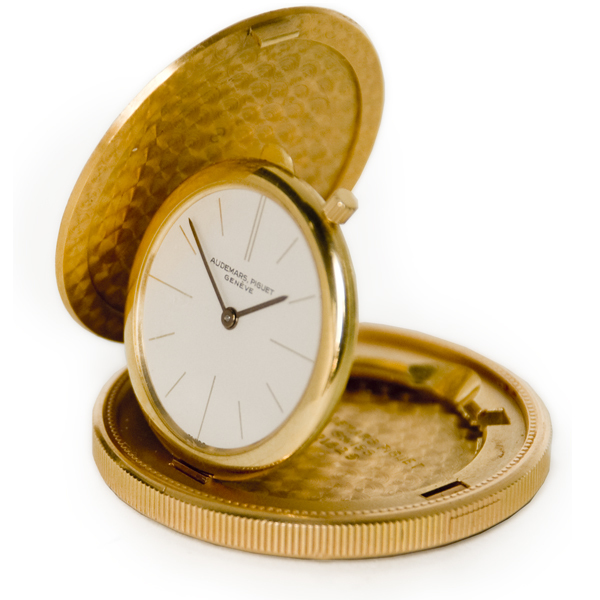 An 18 carat gold coin watch from the 1970s (This watch still has its original papers and box; pristine, it appears to have been bought and then never used.) Coin watches were made by many brands, from Corum to Ebel to Patek; each is a masterpiece of engineering, with a watch constructed to fit inside a coin; usually, as in this case, a gold one. 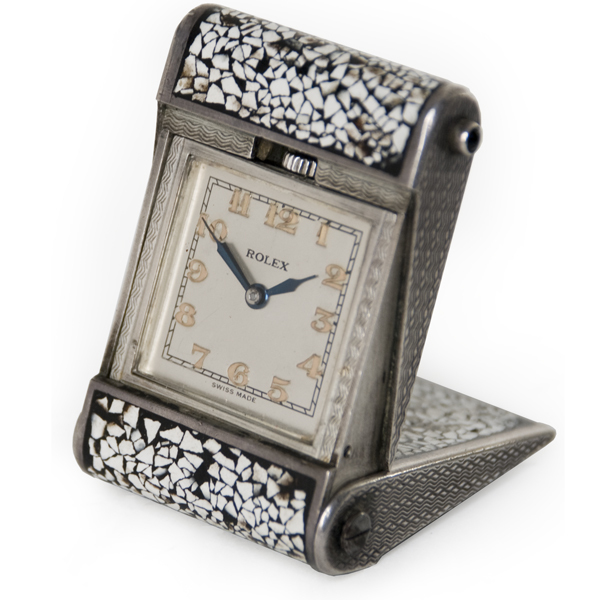 This watch was often called a Golf Watch and was made by Rolex for golfers who didn't want to wear a watch on their wrist for fear of throwing off their swing. This golf watch attached to a golf bag instead. 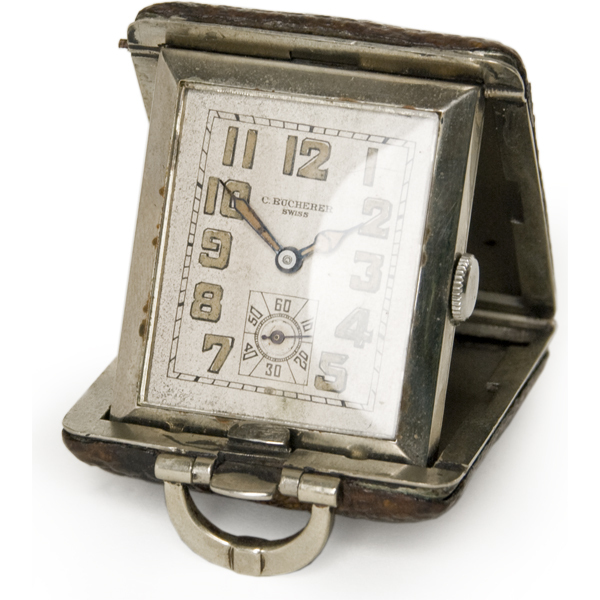 It was retailed by Bucherer, the luxury store that often co-sold Rolexes in the 1930s and 1940s. 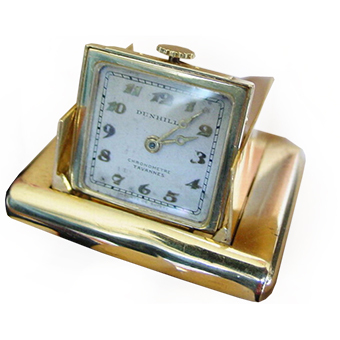 A gold plated alarm travel watch with a 17 jewel, unmarked Swiss movement. 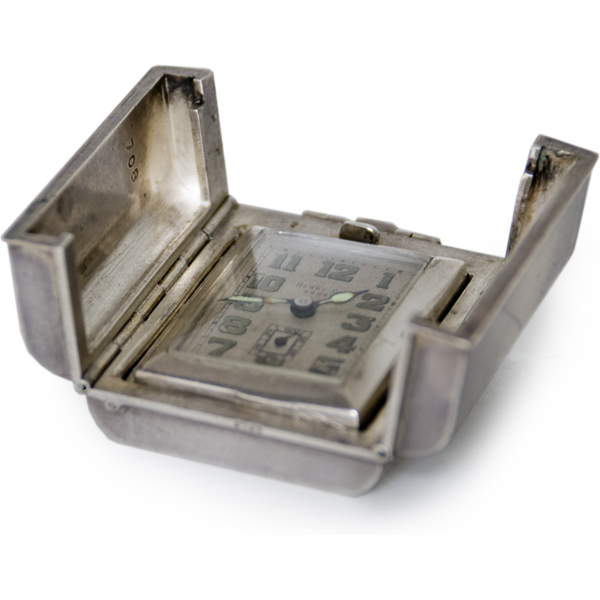 Most alarm travel watches were made by Movado; few were ever made in this sliding Eclips case. Some of these travel watches were actually made to slip over a belt, such as this 1950s one from Kalish, a small brand of which no one seems to have heard. Perhaps it is a store rather than a brand. 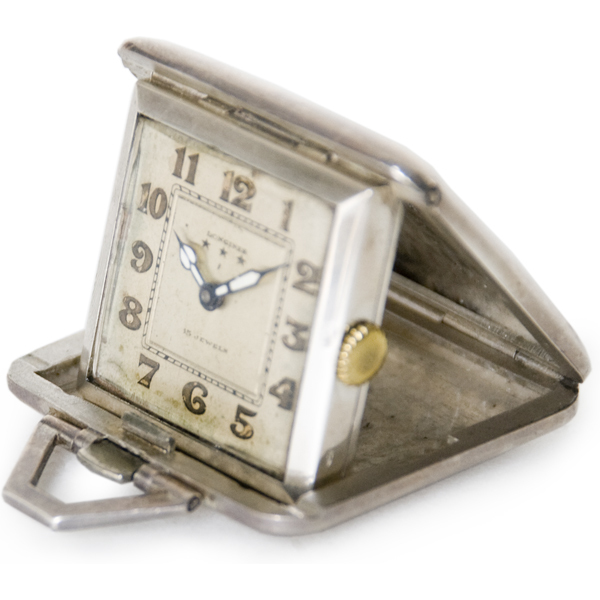 A very tiny, deco nickel travel watch from Bucherer, probably from the 1930s, with an unmarked Swiss movement. 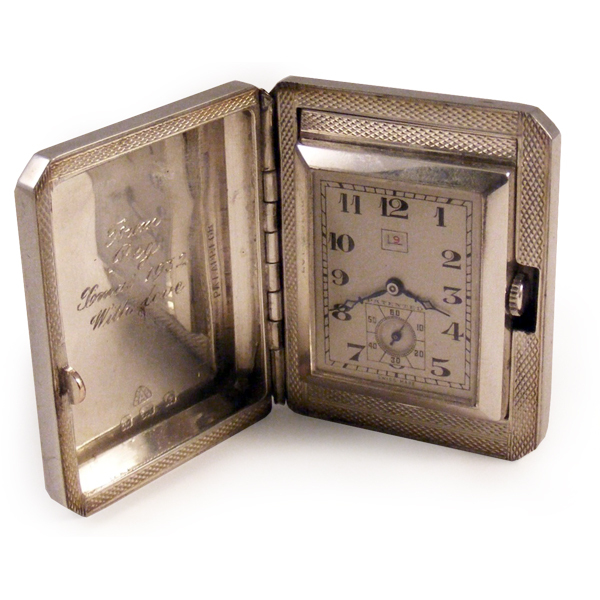 An extremely odd travel watch that when shut resembles a letter: on the sterling silver case is etched the space for an address and a stamp. The movement is an unmarked but good Swiss one. Possibly from the 1940s. 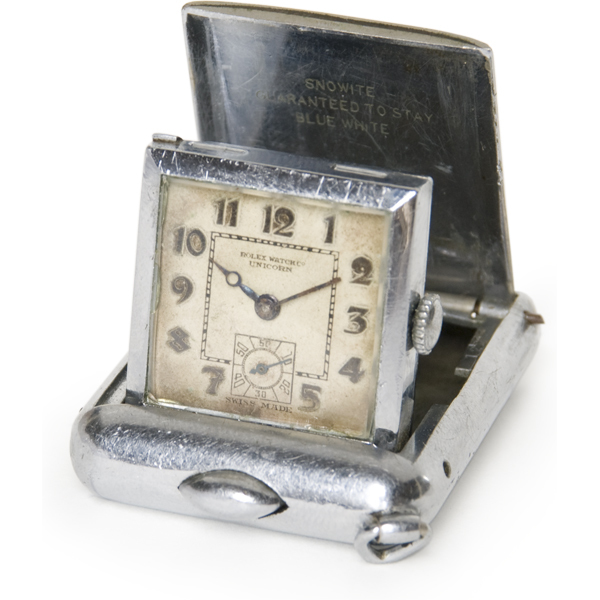 A sterling silver Longines from the 1930s with a signed Longines movement. 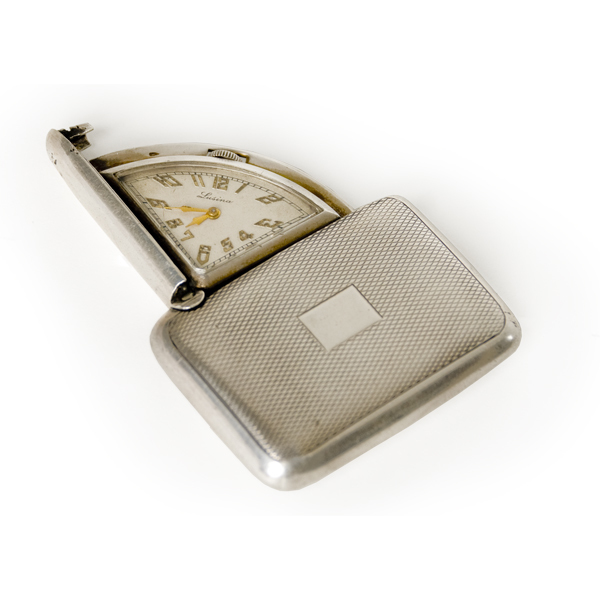 Henry Capt was a very well-known and successful pocketwatch maker located in Geneve, Paris, and London. Henry Daniel Capt was an associate of Isaac Daniel Piguet in the early 1800s; his son Henry Capt opened London offices and later had a shop there. 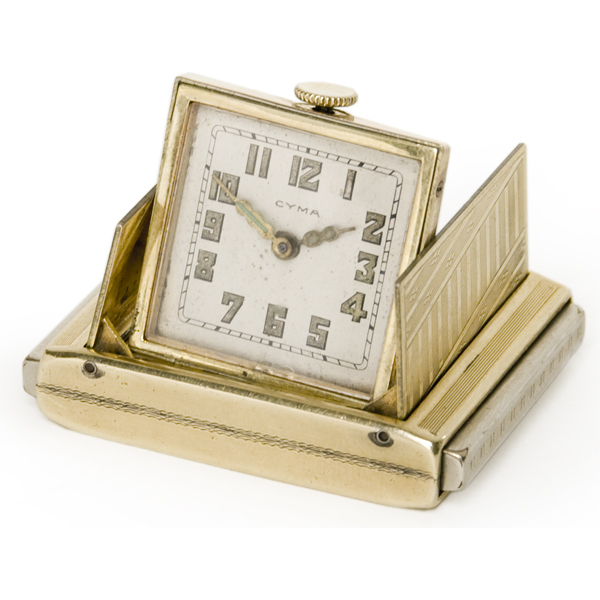 The company made very high-end repeaters and calendar watches, competing with Patek and Vacheron until it went out of business sometime around World War I, making this sterling silver watch one of the earliest travel watches in existence. The movement is unmarked Swiss, the case and dial are marked Henry Capt, Geneve. Tavannes was an excellent Swiss company dating back to the 1890s that made watches for many other brands, including Tiffany and Cartier. 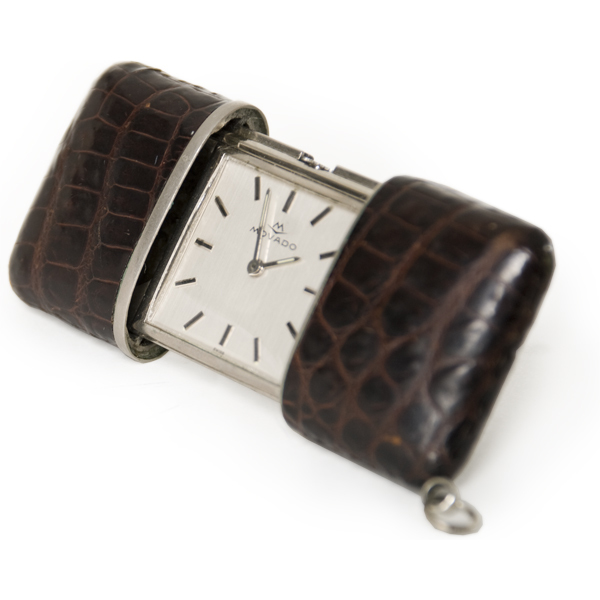 This sterling silver and alligator watch is in excellent shape. These two Monokier pop-up travel watches are identical except that one is sterling silver, and the other sterling silver and black enamel. Both are in excellent shape, and have an unsigned Swiss movement. 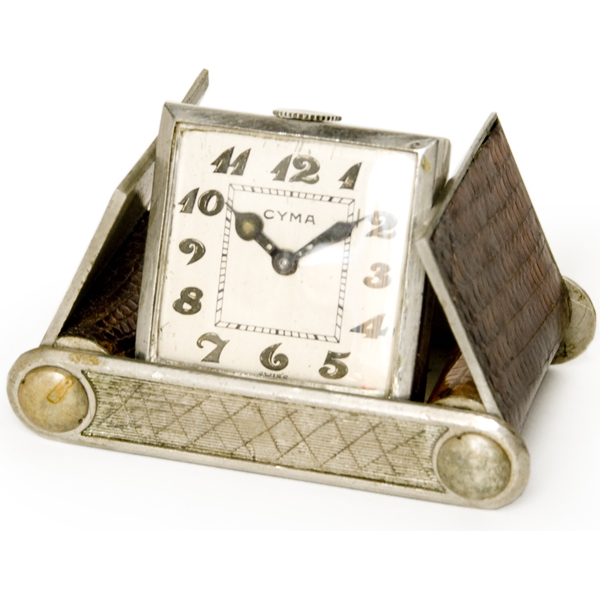 A very heavy sterling silver Alpina travel watch with an etched art deco front from the 1930s. The movement is signed Alpina. 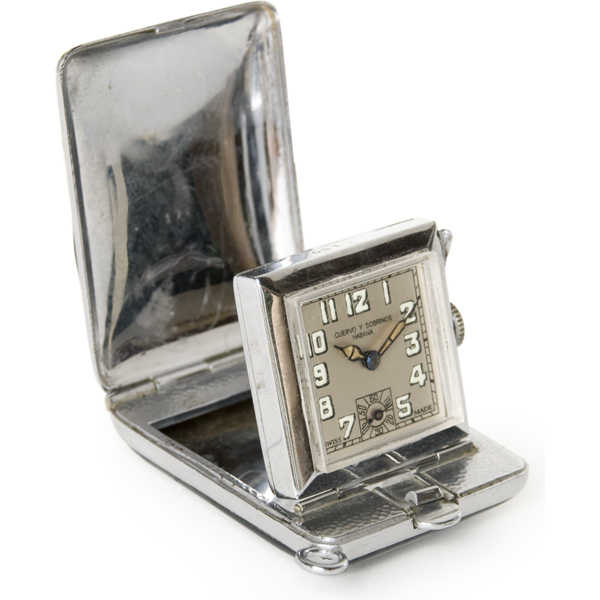 A sterling silver Dunhill from the 1930s. 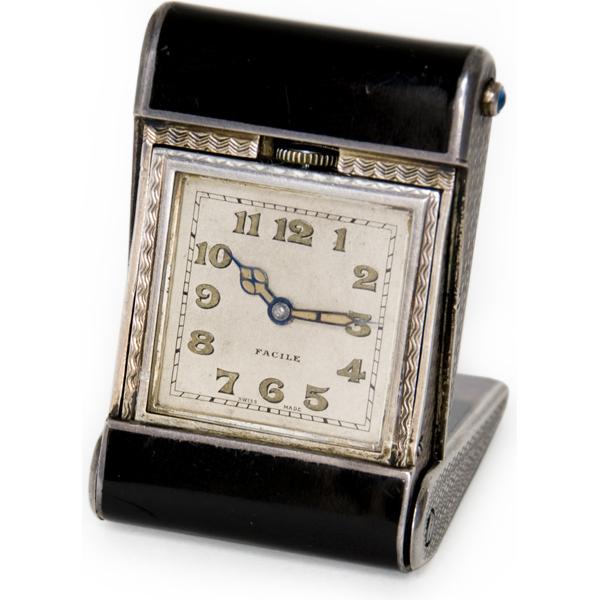 A very small black and green enamel Cartier watch from the 1930s or 1940s. The movement is European Watch Company. 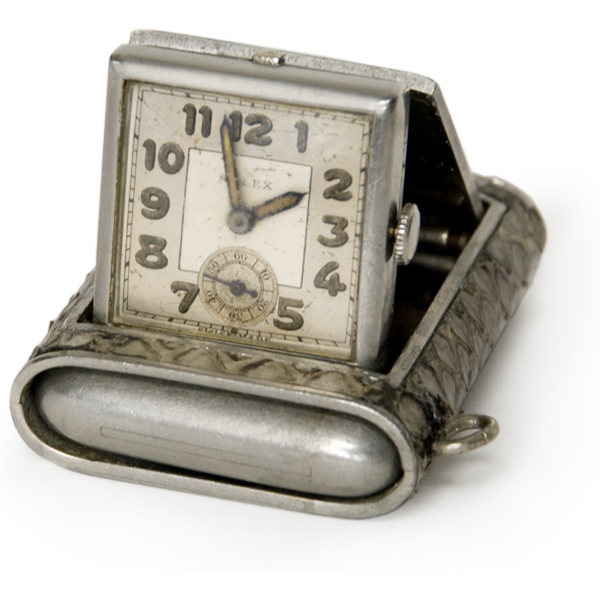 This unusual, sterling silver pop-up travel watch was retailed by Tiffany sometime after World War I, and has an 18 jewel Longines movement. Rolex used many names besides Rolex in its early days, including Marconi and Unicorn; travel watches were made for both these two brands. Here is an inexpensive Unicorn model with a steel rather than silver case. The movement is signed Unicorn Prima. 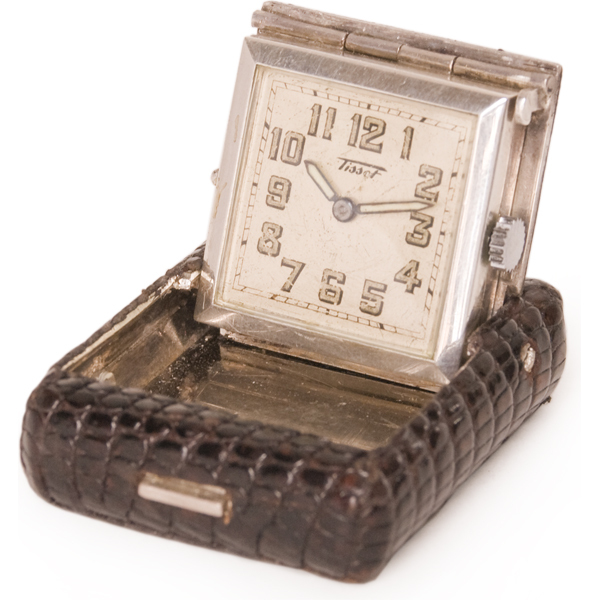 A Rolex from the early 1920s, with alligator skin good condition. The movement is signed Rolex as well. 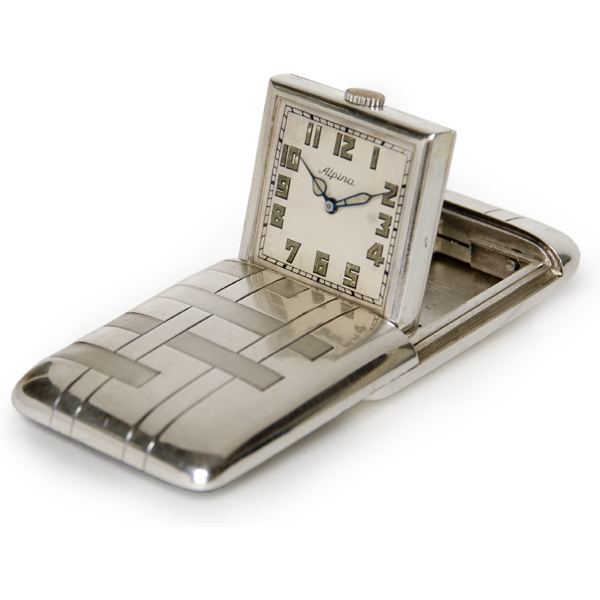 This is a very odd, sterling silver Gubelin watch with a Gubelin movement. For some unknown reason, it was commissioned by someone who wanted separate crowns, one to set the watch and one to wind the watch. 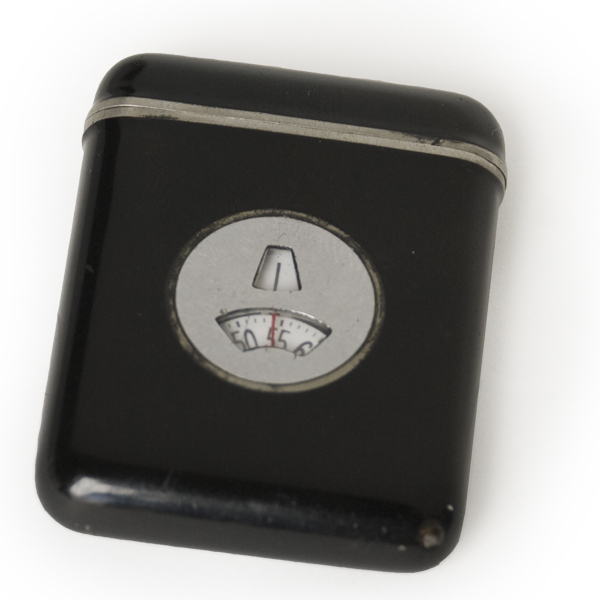 The watch slides forward on the case for balance so it can sit on a flat surface. 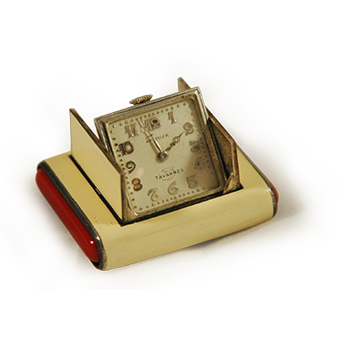 A gold plated Hermes from the 1940s with a movement marked Hermes. An unusual model, this steel Invicta from the 1950s has an alarm feature that still works well. 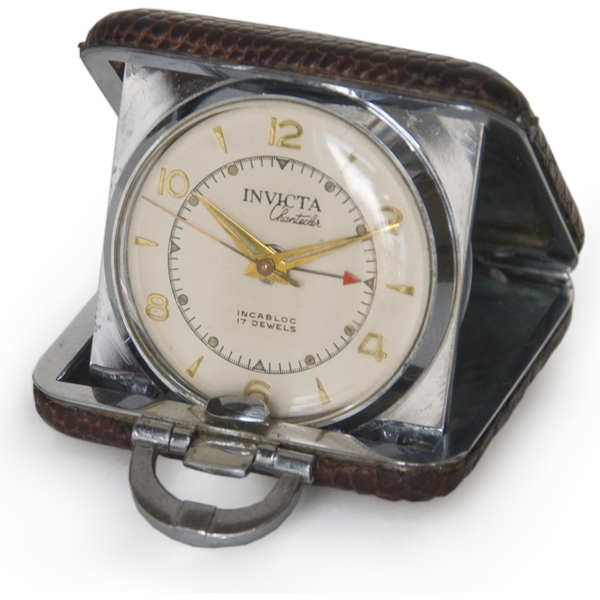 Invicta, founded in 1837, made relatively affordable Swiss watches for several generations. A Gruen Guild steel travel watch from the 1940s with a Gruen movement. Although an American brand, the company manufactured its movements in Switzerland. 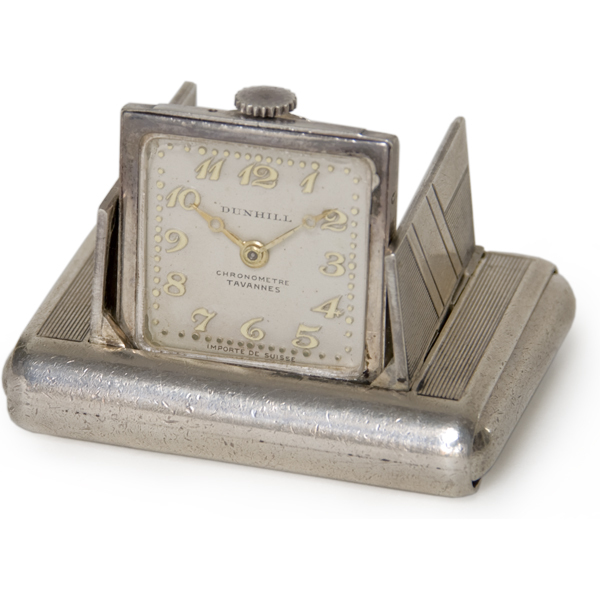 This highly unusual sterling silver Dunhill travel watch from the 1930s has a perpetual calendar built into the case, with a small horizontal rod in the back of the watch that can be turned to change the day. 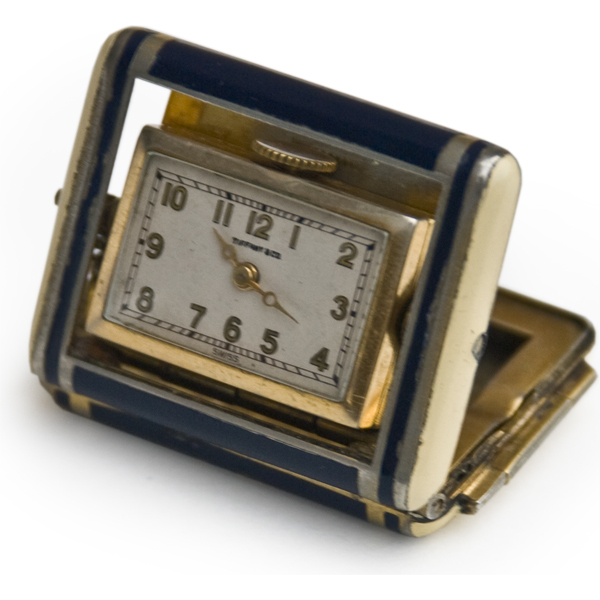 This Cuban maker of fine watches went out of business many years ago, although the name is now being used by a new company. 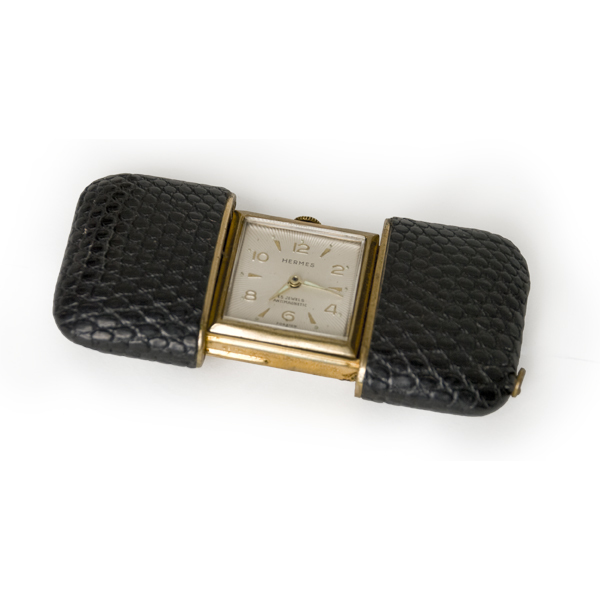 This particular travel watch dates from the 1940s and has a Swiss movement by Condal. Driva was a small and highly respected Swiss company that made ebauches for many brands including Patek Philippe, often containing intricate complications such asrepeaters. This is a rare and well preserved watch. 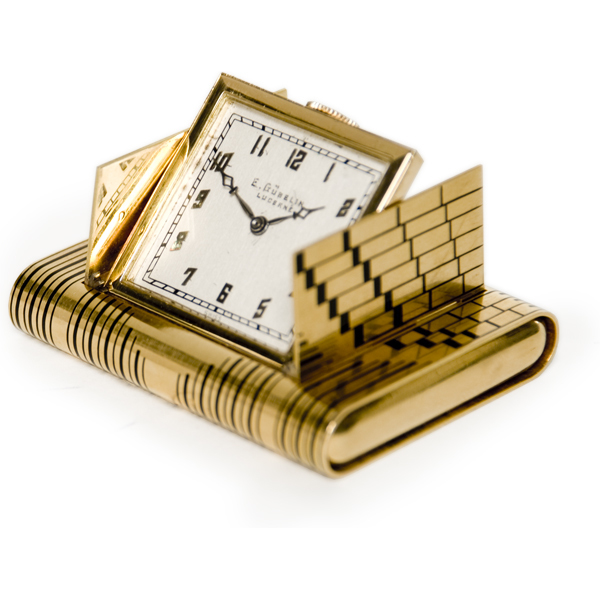 A gold plated Eclips with an unmarked Swiss movement, probably from the 1950s. 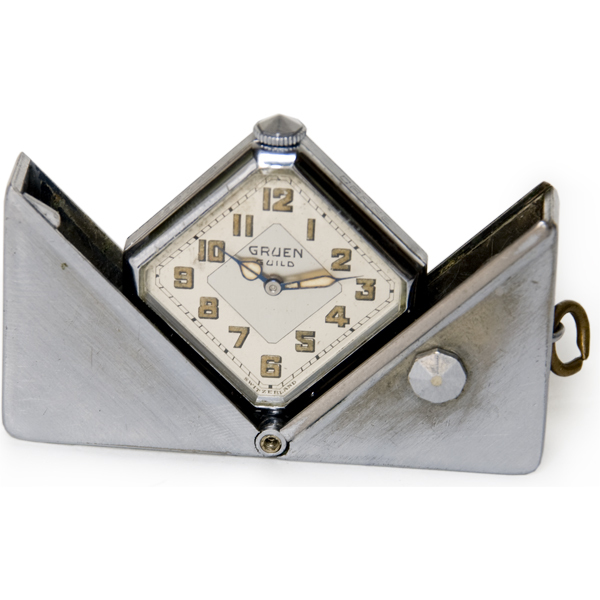 The design copies the Gruen travel watch made popular by that brand in the 1940s. A leather covered Tissot from the 1940s with a good Tissot movement. 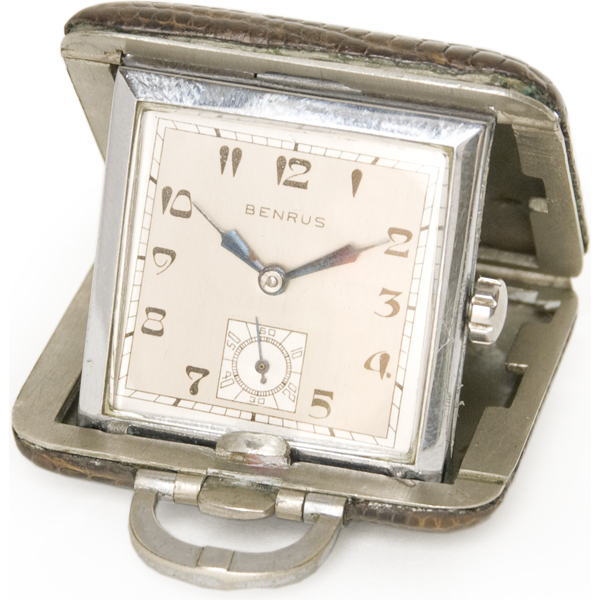 An unusual American travel watch from the 1940s, with a Benrus movement. Vertex was a small but well-respected Swiss watchmaker; this travel watch has a very nice leather casing. 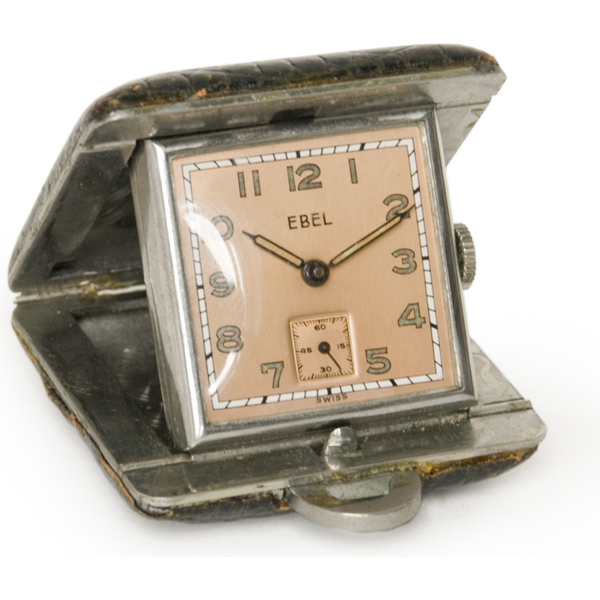 A pretty Ebel with a copper-colored dial, possibly from the 1950s. 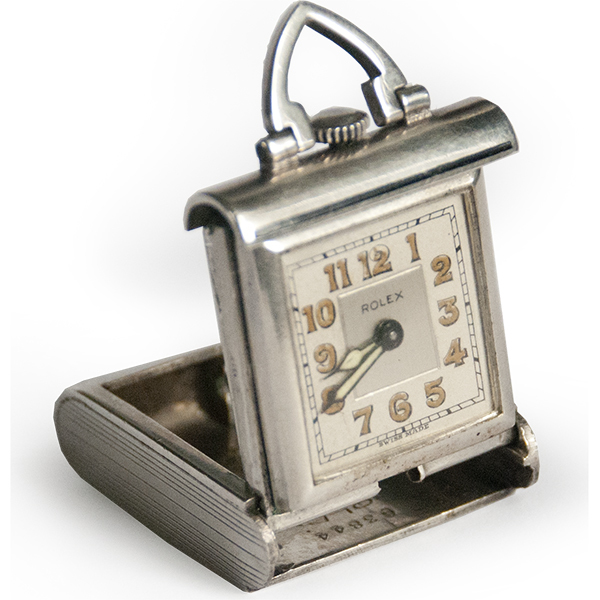 From the 1940s, a classic sterling silver Bucherer. 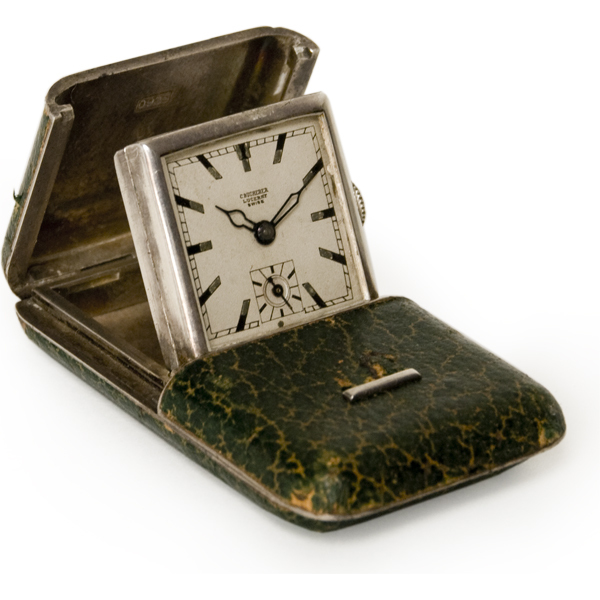 A small travel watch that folds neatly into its green case, in excellent shape. 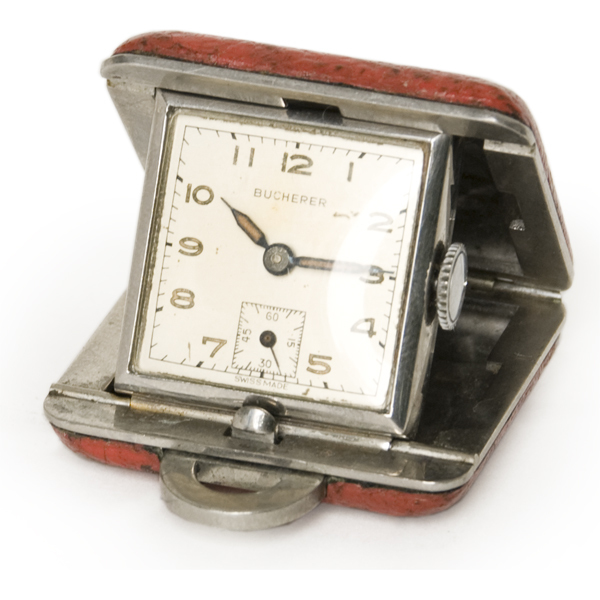 A very small red Bucherer travel watch with a Bucherer movement. A red and black enamel Girard Perregaux from the 1930s or 40s with a nice Girard Perregaux movement. GP, founded in 1856, has made excellent watches for almost one hundred and fifty years. Gubelin is the Tiffany of Europe, one of its greatest jewelry and watch retailers. 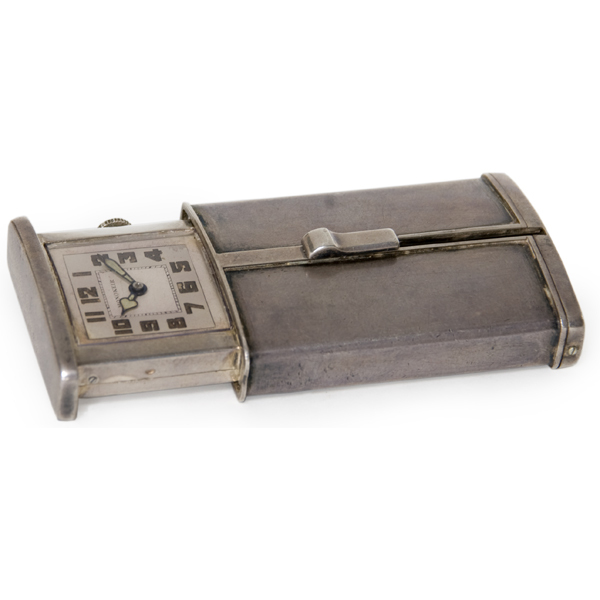 This travel watch is very unusual in that the case mechanism contains a catch that allows the watch dial to spring to the front of the case for easy viewing. 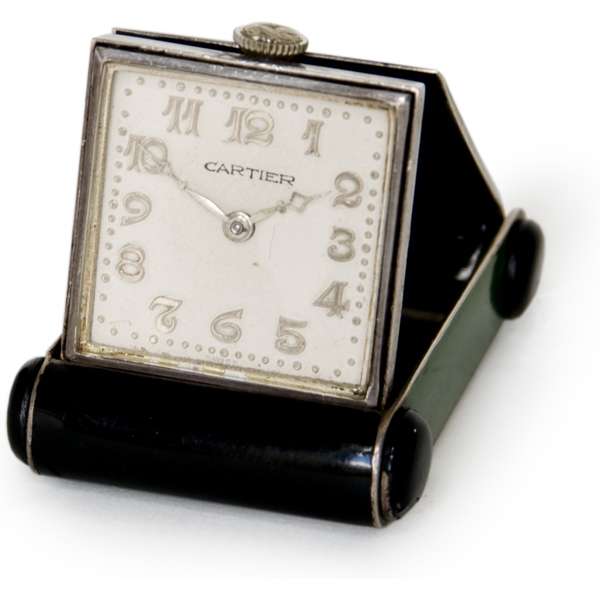 An extremely unusual, sterling silver and black enamel hidden dial Cartier with an unmarked but good Swiss movement. Possibly from the early 1930s. 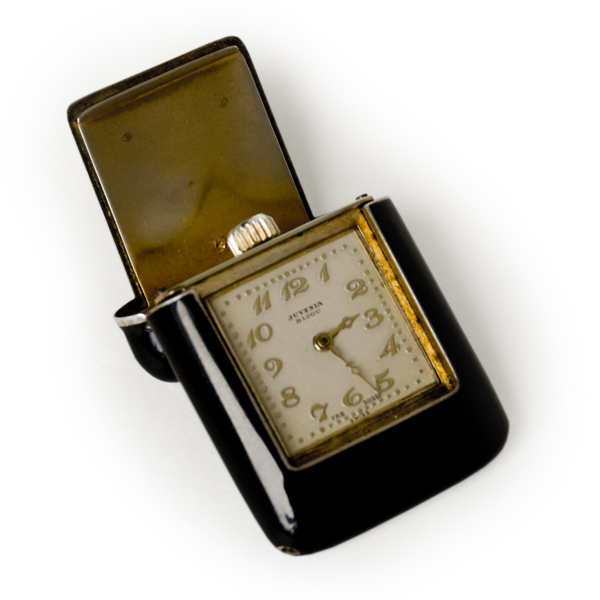 This odd Tiffany watch from the 1930s has a good but unmarked Swiss movement. The case action is unusual in that the watch dial swivels out from the case as yoy press the sides of the watch, allowing the dial to be seen on what is the reverse side of the case compared to the other travel watches. 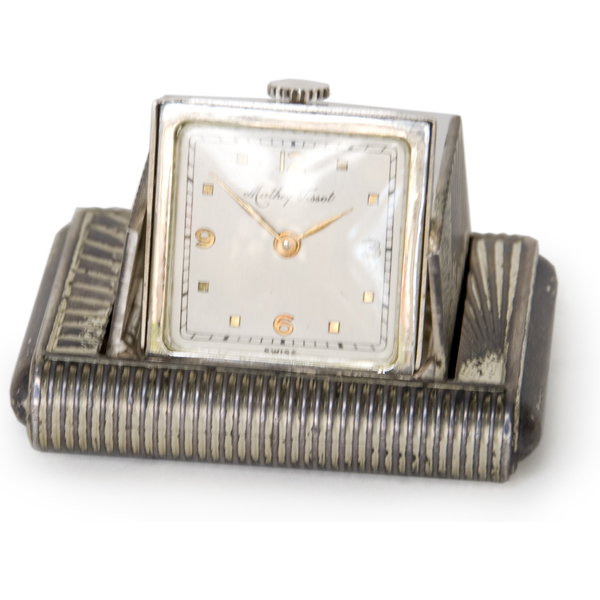 An odd sterling silver watch from Mersmann, with a Mersmann Swiss movement as well. I don't know anything about the manufacturer other than it was a retail outlet in Germany. 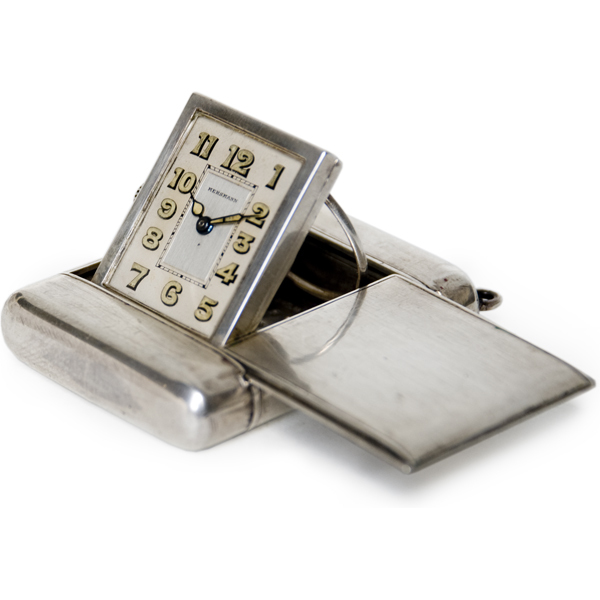 The case is unusual in that a slim silver ring comes out to hold the watch in place. 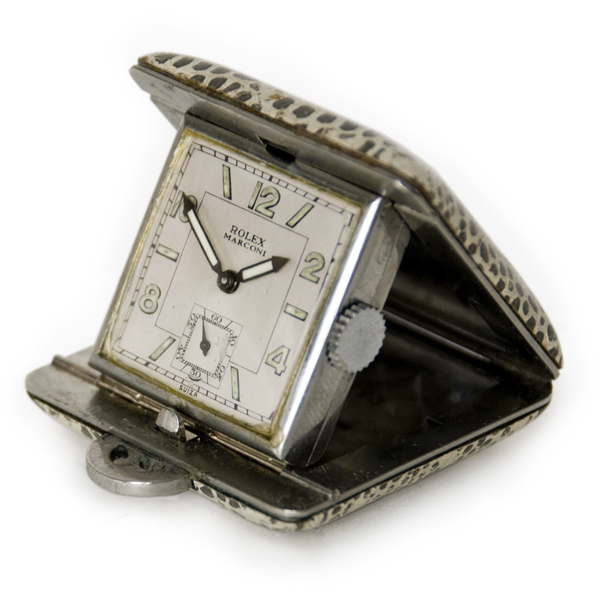 This Rolex from the late 1920s is in near-perfect condition. The 15-jewel movement is marked Unicorn, which was one of the several names Rolex used for its watches is its early history, along with Marconi and Rolco. The dial has a remarkable starburst pattern that catches the light, making the dial sparkle without taking away the ability to tell the time easily. An extremely rare and unusual wooden travel watch, made by the high-end jeweler Van Cleef and Arpels approximately 1950. 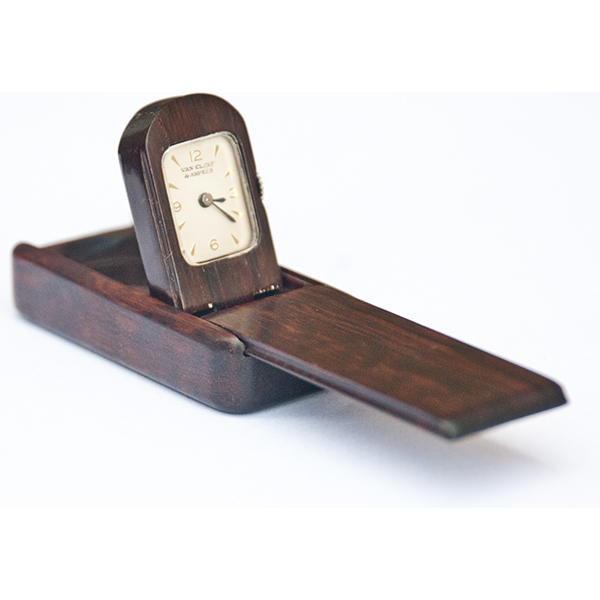 A wooden panel slides out to reveal the watch; the case is in excellent condition except for a hairline crack in the wood at the top of the case. Inside is a 15-jeweled unmarked Swiss movement. Both the choice of wood and the shape of the watch--casket like--are unique. 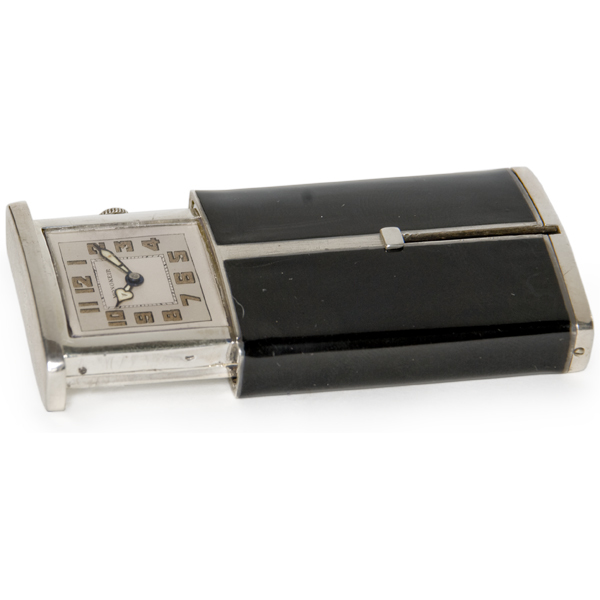 In 2001 Van Cleef and Arpels reissued what they called the "Pendulette Domino" watch in a limited edition. 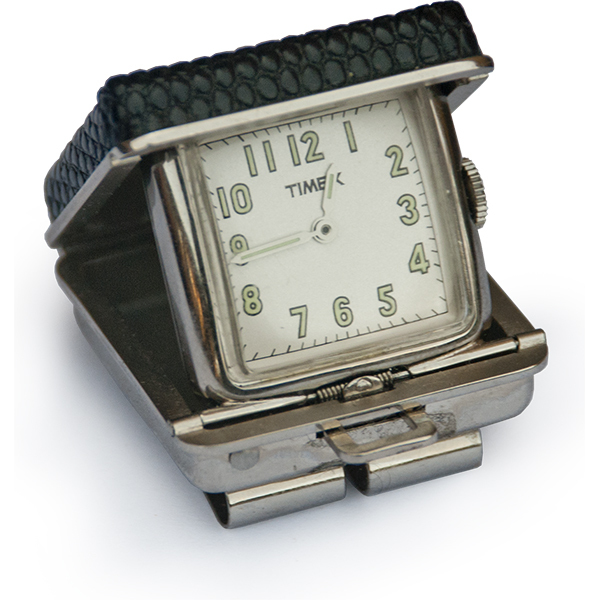 A combination money clip and travel watch from Timex, circa 1980s. 18k yellow Gold Dunhill travel watch with a Tavannes movement. 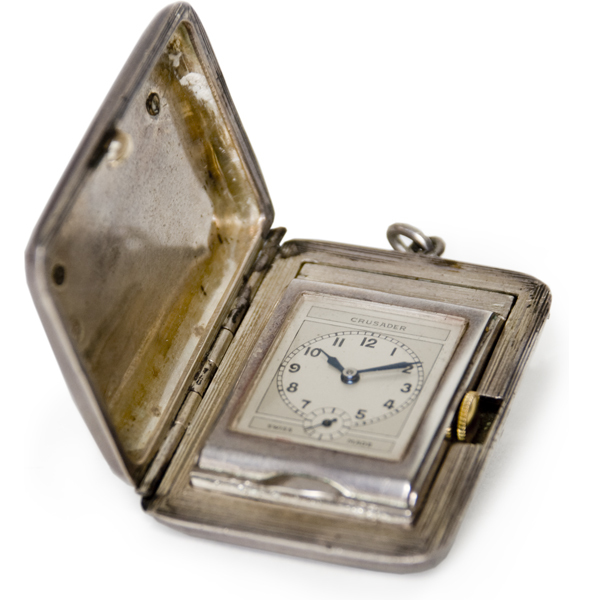 The old Swiss company Tavannnes made movements for many of the major watch brands, but travel watches were one of the company’s specialities. This one is unusually clean and the solid gold creates a heavy but sleek object. Tavannes was one of the major manufacturer of travel watches and sold them either under its own name or with another brand or store. 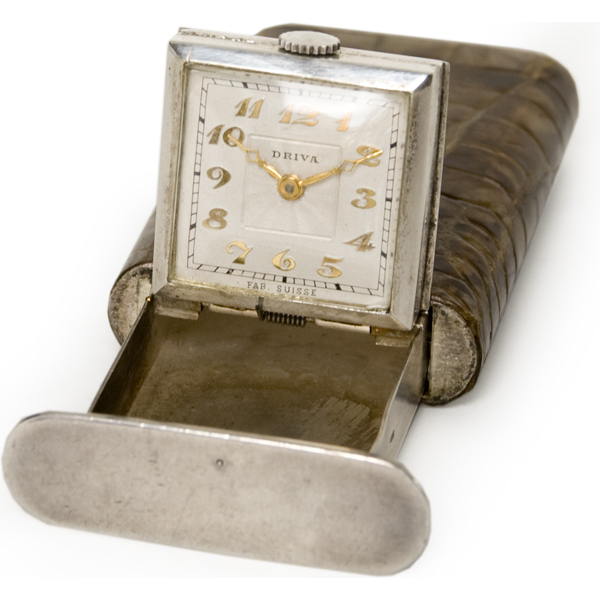 This particularly beautiful and unusual travel watch has both Tavannes and Kreisler on its dial. 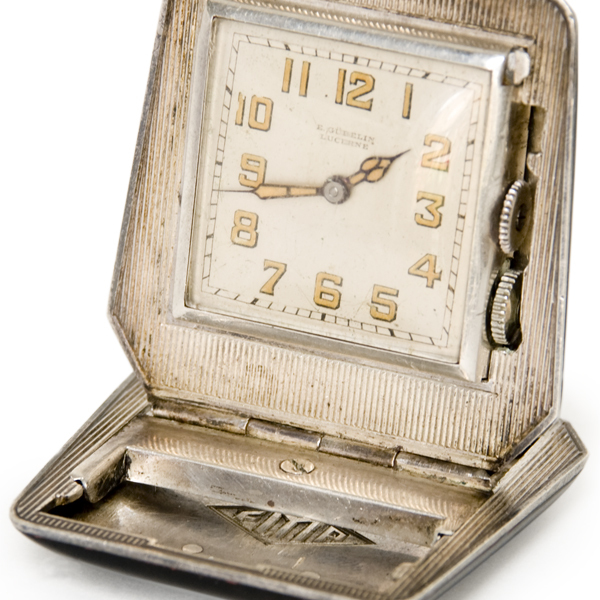 The case is made of sterling silver and is covered in a cream-colored enamel. The side buttons are bright red enamel and, on the back of the case, is a raised, cut, red stone, either carnelian or sardonyx, that matches the buttons’ deep color. All in all a beautiful and well-preserved model. Another very unusual Rolex travel watch. This one is cased in sterling silver and decorated with bright green enamel along with other engravings. It is one of the most beautiful travel watches I’ve ever seen, in perfect condition, looking as though it were a perfect watch held captive within a jewel.